In-depth case study exploring how you create an enterprise-wide innovation program with a multi-billion dollar business impact. Nokia is the world’s largest provider of telecommunications technology, with more than 114,000 employees and over €23 billion in revenue (2015). Over the past decade, Fabian Schlage, Innovation Manager at Nokia, has built a powerful innovation management ecosystem for the company, backed by HYPE’s innovation platform. Including efficient processes, tools, and proven methods, it is designed to industrialize innovation management, i.e., to standardize processes, routines and culture, and thus to make innovation success repeatable. 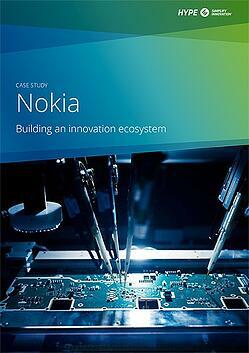 In this case study, we look at some key elements of innovation management at Nokia and how it grew from a single department across the entire business.